Henry Ossawa Tanner, Christ Appearing to Nicodemus (1899), oil on canvas, 33 11/16 x 39 1/2 in. John Rogers Herbert (1810-1890), Our Saviour Subject to His Parents at Nazareth (1847), Oil on canvas, 32 x 51 inches, Guildhall Art Gallery, London. Quite striking in color. Albert Roberti, detail of Christ carrying the cross, Brussels, dated 1851. Museum of Ancient Art, Brussels. 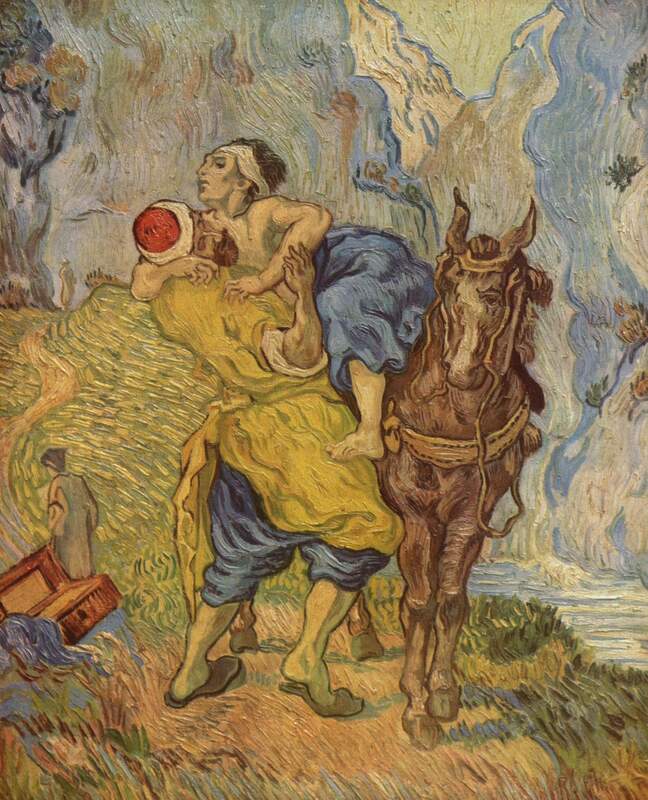 Vincent van Gogh, "The Parable of the Good Samaritan" (1890, Der gute Samariter, nach Delacroix), �l auf Leinwand, 73 x 60 cm, Kr�ller-M�ller Museum, Otterlo. Rembrandt, Parable of the Good Samaritan (1632-33), �l auf Holz, 27.5 x 21 cm, Wallace Collection, London. Piet Esser, sculpture: "Barmhartige Samaritaan" (1976, Good Samaritan), placed at the Troosterlaan / Zwaardemakerlaan, Utrecht. Dreams (On a Hill) (1894), Oil on canvas, 151 x 142 cm. Another. Another (1894). Larger. Moscow. 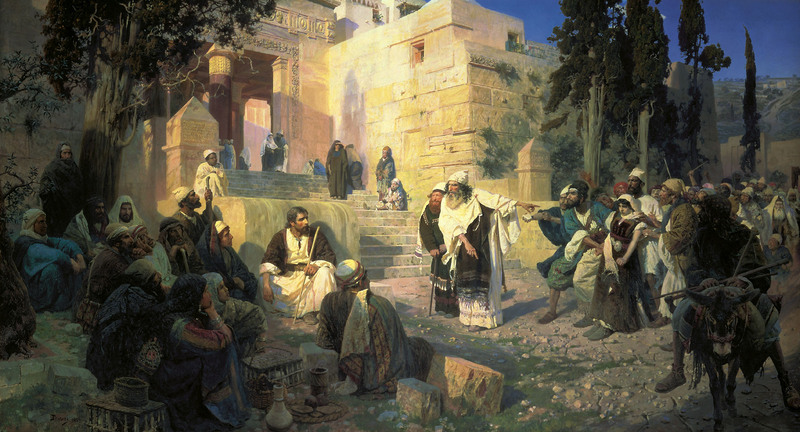 Raising of Jairus' Daughter (1871), oil on canvas, Museum of the Academy of Arts, St. Petersburg, another? On the Tiberias Lake (1886), oil on canvas, Tretjakov Gallery, Moscow. Another. An Olive-Tree in the Garden of Gethsemane. 1882. Oil on canvas. The Tretyakov Gallery, Moscow, Russia. Cleansing the Temple, oil on copper plate. Come Unto Me, with hands outstretched, begger, cripple at his feet. Harry Anderson (American Illustrator, 1906-1996). Seventh Day Adventist painter and illustrator. 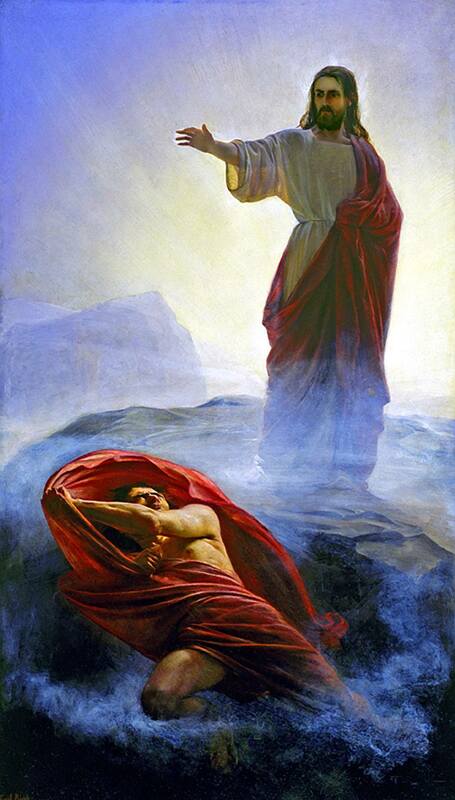 Several of his paintings are available from the LDS Distribution Services site. Prince of Peace. Jesus knocking on the UN building in New York City. Another. Both secular and sacred illustrations. Love Welcomes the Prodigal, Reproduced in 'Christ's Object Lessons', Signs Publishing. Date unknown. Divine Counselor. 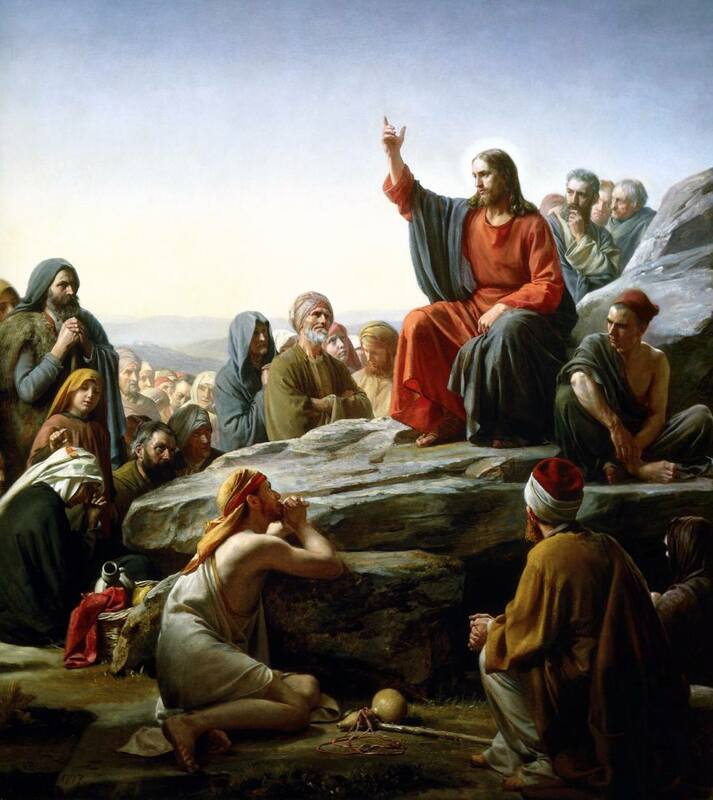 Jesus conversing in an office with a businessman dressed ca. 1950. The Consultation. Jesus next to a physician at the bedside of a sick woman. Simon the Cyrene Carries the Cross, Jesus walks alongside. 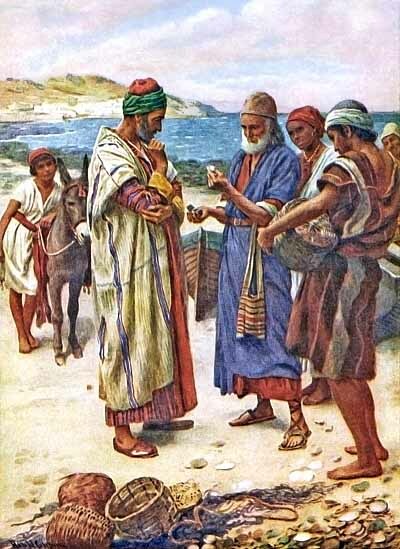 Go Ye Therefore (Matthew 28:19-20). Great Commission. 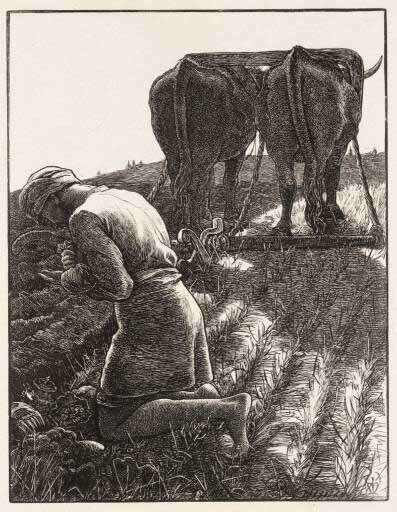 Harold Copping (1863-1932, British Illustrator), produced The Copping Bible (1910), The Bible Story Book (1923), and My Bible Book (1931). Illustrations and paintings. Fractio Panis Fresco ("the breaking of bread), Greek Chapel, Catacomb of St. Priscilla, fresco, third century, on the arch over the altar tomb, upon which the sacrament of the Eucharist was performed. It probably represents the eschatological banquet in the Kingdom of God. Morgan Weistling (California illustrator and painter, 1964- ). Beautiful paintings of Jesus and spiritual life by a California illustrator. All paintings are protected by copyright. Most of these are found in Morgan Weistling, The Image of Christ (Baker Books, 2000), ISBN 0801011965, beautifully illustrated with poems and meditations by various authors. Images can be seen at World-Wide-Art.com and ChristCenteredMall.com. Many of his non-religious paintings feature adults and children, rural, 19th century Americana. More at his website. "Walking with God" (2000) Jesus holding up the hands of a toddler helping him to walk. Carpenter tools and woodchips are on the floor of Joseph's carpenter shop. "The Lord Is My Shepherd," Jesus carrying a sheep over his shoulders, walking in sandles with a happy expression on the ridge of a hill(Luke 15:3-7). "The Reflection of God," Jesus standing waist deep in a river, looking up with palm open, pictured in a meditative moment prior to his baptism. "Kissing the Face of God" (1998). Mary holding the baby Jesus, kissing him on the cheek. Amazing image of mother-love. "Crucifixion" (2001). Jesus, on the cross, naked from waist up, looking up with light flooding his face. No wounds visible. Haunting expression on Christ's face looking up to the Father, just before the Father withdrew from him. "Healing the Blind Man," Jesus laying his hands on the eyes of a kneeling blind man, lit with the crowd in the background darker. Their faces showed the varied reactions to his miracles. "Known by His Scars," dimly lit Jesus displaying his lit, scarred hands. "My Lord and My God," portrait, face of Jesus covered by a white hair covering (John 20:27-28). "A Thankful Heart" (2001). Girl with white apron, long dress, single pigtail and folded hands praying before a meal. Reminiscent of Norman Rockwell. "Thy Will Be Done" (1998). Jesus, with white hooded robe, with folded hands, standing in prayer. "I wanted to emphasize his strong carpenter's hands, clasped in prayer, representing his communion with the Father" - Morgan Weistling. "Water to Wine" (1998). Jesus standing under a stone arch extends his hand over pot into which servants are pouring water. Wine glows red. "The Invitation" (1996). Jesus standing outside a lit banquet in the background, grasps the outstretched hand of a beggar kneeling in the snow and invites him inside. 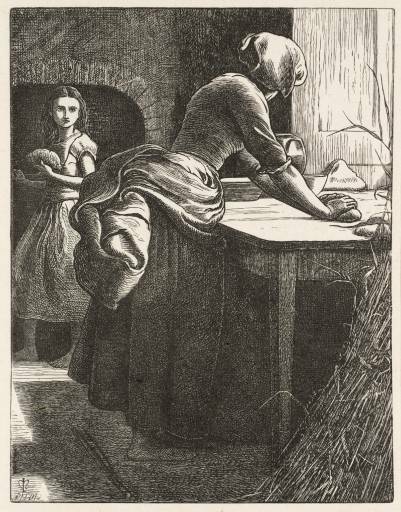 Sir John Everett Millais, (Pre-Raphaelite painter, 1829-1896), "The Leaven" (1864), relief print, 140 x 108 mm, from illustrations to The Parables of Our Lord, engraved by the Dalziel Brothers. Larger image. 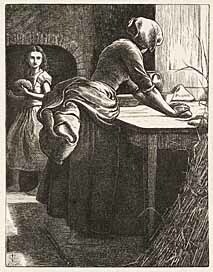 Sir John Everett Millais, (Pre-Raphaelite painter, 1829-1896), "The Hidden Treasure" (1864), relief print, 140 x 108 mm, from illustrations to The Parables of Our Lord, engraved by the Dalziel Brothers. Larger image. 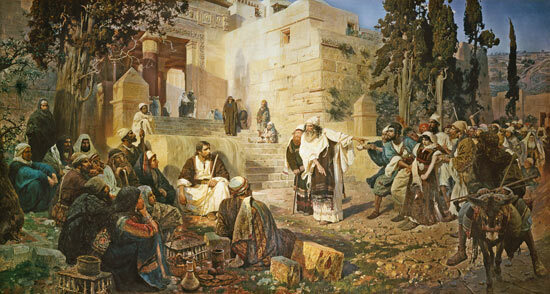 Tissot painted many, many events in the Life of Christ. You'll see links to hundreds of his paintings on this and a companion site. Peter von Cornelius (1783-1867), The Wise and Foolish Virgins (1813). von Cornelius was a member of "the Nazarenes." Edward Coley Burne-Jones, The Wise and Foolish Virgins (1859), pen and ink drawing.